Mobile development start-up Inmite joins AVAST team! Our 220 million AVAST users are moving many of their online activities to mobile devices, just like the rest of the world. Cybercriminals are well aware of the shift and are increasing their activities as well. In order to better protect our current and new mobile users, we are pleased to announce that we brought Inmite, a mobile application development firm, into the AVAST family. Through this acquisition, we are adding 40 very talented and experienced mobile developers to our growing mobile business. “Inmite’s team consists of great mobile developers and by joining AVAST, they’re going to further accelerate our growth and expand our capabilities across mobile platforms,” said Vince Steckler, CEO at AVAST. Inmite has built more than 150 mobile iOS, Android and Windows Phone apps for the automotive, banking, media and telecommunications industries since 2008. The company is recognized as a Top Developer on Google Play, and also developed the world's first Google Glass banking prototype, and other 'internet of things' devices. "In order to make a greater impact worldwide, we wanted to go big with a global mobile leader who believes in technologies for the future. AVAST shares this vision and is the ideal partner for us," said Barbora Petrová, spokesperson of Inmite. Read more on VentureBeat, Avast acquires Czech mobile dev shop Inmite, and in the official press release. 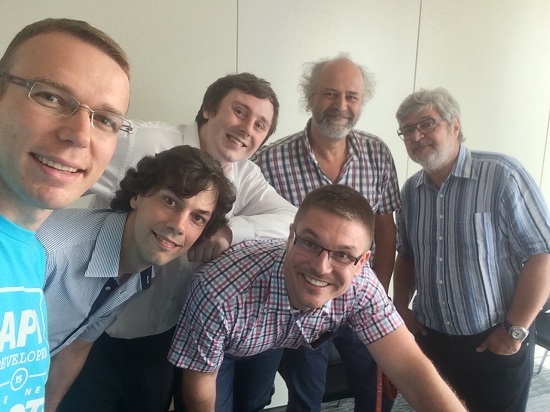 Avast co-founders Eduard Kucera and Pavel Baudiš take a Selfie with Inmite company founders.